Also serving communities of Saint Johns, Saint Johns. There are 64 Assisted Living Facilities in the Fleming Island area, with 2 in Fleming Island and 62 nearby. The average cost of assisted living in Fleming Island is $4,000 per month. This is higher than the national median of $3,346. Cheaper nearby regions include Green Cove Springs with an average starting cost of $2,500. To help you with your search, browse the 337 reviews below for assisted living facilities in Fleming Island. On average, consumers rate assisted living in Fleming Island 4.6 out of 5 stars. Better rated regions include Ponte Vedra with an average rating of 5.0 out of 5 stars. Caring.com has helped thousands of families find high-quality senior care. To speak with one of our Family Advisors about assisted living options and costs in Fleming Island, call (855) 863-8283. New Horizon Healthcare Center Inc.
Fleming Island is named for the Fleming family who once owned a plantation on the site. It's now home to around 27,000 people, with residents aged 65 and older making up 16 percent of the population. Seniors interested in retiring to the area can find accommodation in one of the area's 65 assisted living facilities. These facilities are licensed and monitored by Florida's Agency for Health Care Administration. The Fleming Island area is home to world-class medical facilities, including Baptist Clay Medical Campus, in the event of medical emergencies or illness. Seniors who enjoy catching a show may wish to visit The Island Theater. Seniors in Fleming Island can also enjoy the art and cultural attractions of Jacksonville, such as the Southlight Gallery or the Museum of Contemporary Art. Fleming Island is a relatively safe community with an overall crime rate that is lower than 82 percent of Florida's other towns and cities. The overall violent crime rate in Florida is more than four times higher than Fleming Island's rate of 0.88 crimes per 1,000 residents. Fleming Island's property crime rate of 11.62 is also low when compared to Florida's rate of 25.12, which may be reassuring to seniors who worry about their safety. Fleming Island has 221 sunny days each year, 16 more than the national average, which may be appealing to seniors who enjoy the sunshine. The low temperature in January averages 45 degrees and in summer the high is around 91, allowing residents to enjoy warm weather year-round. Florida's sales taxes are close to the national average, which helps seniors keep their costs down. In addition, there's no state income tax in the state, meaning seniors have a lower tax bill whether their income is from Social Security, pensions or retirement funds. The Sperling index rates Fleming Island's overall cost of living at 118, which is 18 points higher than the national average. This is mainly due to the impact of high housing costs and seniors will find that everyday expenses like healthcare and utilities are closer to the U.S. average, while the cost of groceries is three points lower. Assisted Living costs in Fleming Island start around $4,000 per month on average, which is on par with the average cost of assisted living is $4,000 per month, according to the latest figures from Genworth’s Cost of Care Survey. It’s important to note that assisted living rates in Fleming Island and the surrounding suburbs can vary widely based on factors such as location, the level of care needed, apartment size and the types of amenities offered at each community. Florida has a number of programs that offer financial assistance to seniors in Fleming Island. 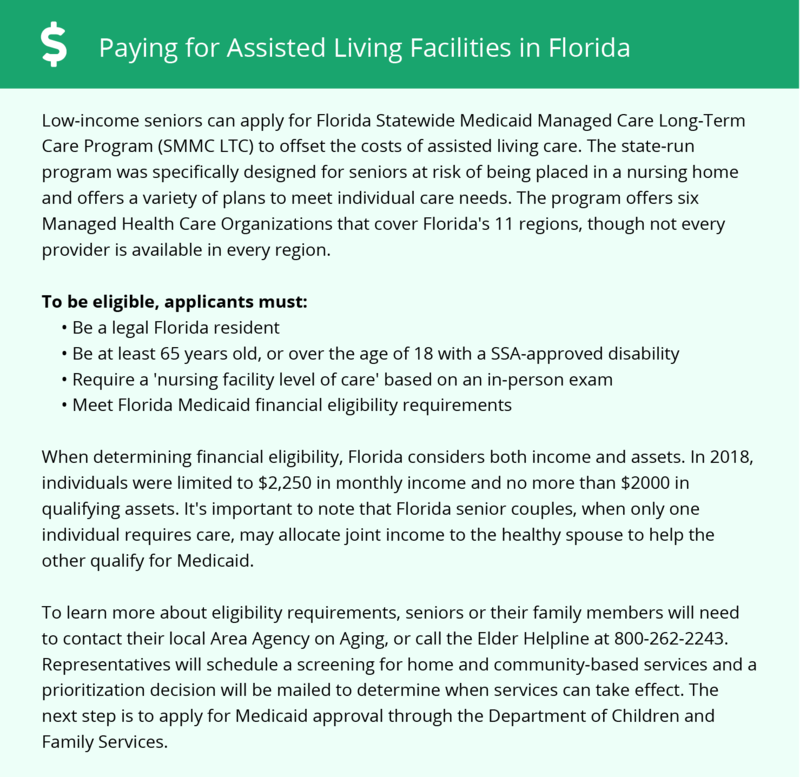 The Medicaid Long-Term Care Program and the Assistive Care Services waiver can help those in assisted living and the Optional State Supplement offers additional funding to seniors receiving Social Security. To see a list of free assisted living resources in Fleming Island, please visit our Assisted Living in Florida page. Fleming Island-area assisted living communities must adhere to the comprehensive set of state laws and regulations that all assisted living communities in Florida are required to follow. Visit our Assisted Living in Florida page for more information about these laws.